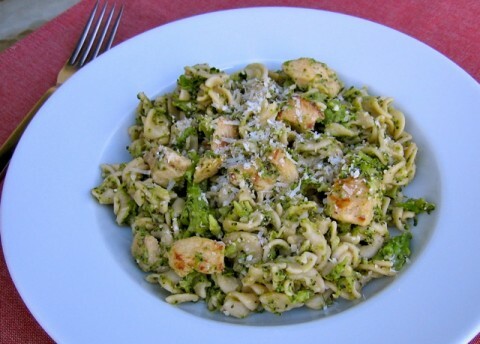 Pasta, and chicken in a simple olive oil, garlic and broccoli sauce. This is one of my favorite quick and easy pasta recipes. According to my calculations, each serving has about 360 calories, *9 Weight Watchers PointsPlus, *8 WW Freestyle SmartPoints. 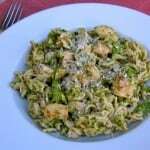 I’ve been making this pasta with chicken and broccoli for years, ever since a work friend shared it with me over lunch one day decades ago. I used to make it with penne or rigatoni, but now I use whatever short-cut pasta I happen to have in the pantry. Last night it was rotini. I like to cook the broccoli along with the pasta, so it falls apart upon stirring and becomes a course puree. It’s delicious with or without the chicken, so leave it out if you like. I’ve made it lighter and healthier through the years too – by using less olive oil and more chicken broth, white wine and some of the reserved pasta water. Be sure to use good cheese in this simple recipe – not the cheap stuff; it’s just not the same. 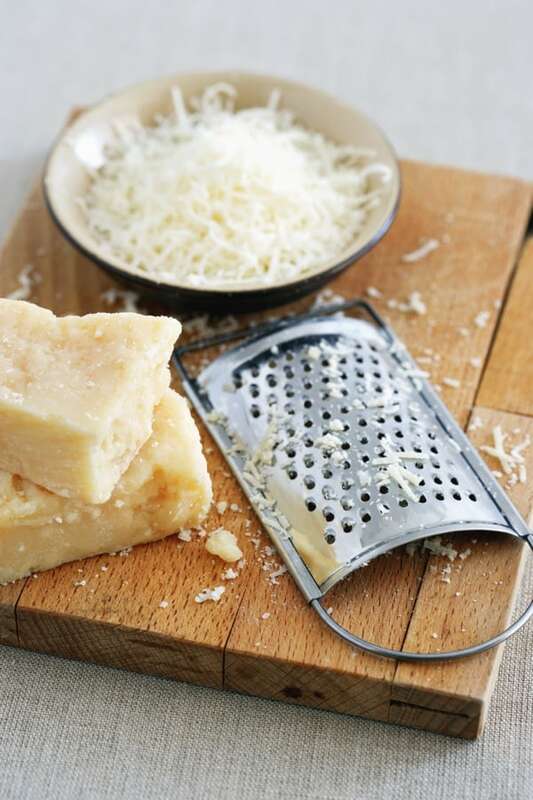 Either Parmigiano Reggiano or Pecorino Romano work well. You can also add some crushed red pepper flakes for a little heat if you like. I like to serve it with a simple mixed green salad. Enjoy! 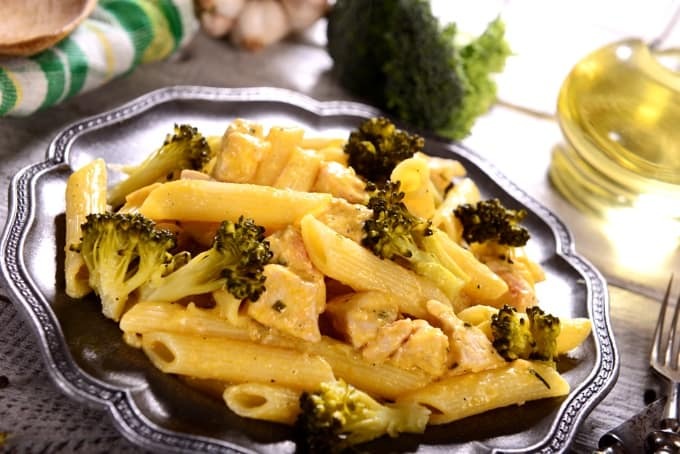 Pasta and chicken in a simple olive oil, garlic and broccoli sauce. Bring a large pot of water to a boil. When water boils, add a generous handful of salt, add pasta and broccoli and cook according to pasta instructions for al dente. When pasta is almost done cooking, reserve about 1/2 cup of the pasta water and set aside. Drain the pasta and broccoli. Meanwhile, heat olive oil in a large skillet over medium-high heat. Add the garlic and chicken and cook, stirring occasionally until the chicken is browned, about 5 minutes. Stir in the chicken broth and wine, if using, and bring to a boil, stirring occasionally. Add the pasta and broccoli to the skillet, along with the grated cheese, salt and pepper and mix well. If the mixture seems dry, add the reserved pasta water, a little at a time, using only as much as needed. This is a quick and very delicious recipe – and the portion size is huge!! This was amaaaaaaazing. Even my toddler ate it! Will for sure be a staple in our house from now on. Thank you!!! Thanks Jennifer. I love that your toddler ate it too!!! What a huge compliment. Thanks so much.